We hope it will give you an insight into what makes our school so special and distinctive. I feel blessed to lead such a supportive, caring and high-achieving school that puts Christ at the centre of everything we do. It is our mission to ensure that all our learners experience a truly great Catholic education that enables them to flourish academically and shine personally, preparing them for a happy and successful adult life. The education at St John Fisher Catholic College is rooted in our understanding of Jesus’ words: “I am the way, the truth and the life.” In 2017, Ofsted noted that "The school's ethos , 'Christ's way , His truth, Your life' , shines through all aspects of school life. It is a welcoming place for pupils, parents and visitors." This mission statement inspires our inclusive school community to share in a love of life , social justice. forgiveness and faith. We are committed to academic endeavours, so that our young people grow and develop God given talents to reach their potential and contribute to society. St John Fisher Catholic College is a high performing, oversubscribed school which was once again rated Good in 2017. Our most recent inspection by the Birmingham Archdiocese rated us as an Outstanding Catholic school. Our academic success is supported by a wide range of extra-curricular activities such as The Duke of Edinburgh Award Scheme, a number of successful sporting teams, a winning Greenpower F24 team, a Young Enterprise team who won the national Innovation in IT 2018 and a wide range of outstanding musical ensembles. Our active and effective school council were highly commended in the Speaker’s School Council Awards 2017. We moved into our new £2.2 million classroom block in December 2018 and completed a full refurbishment of our changing rooms in November 2018. I am extremely proud of the achievements of our learners across a wide range of academic subjects and extra-curricular activities and of our hard working and highly motivated staff. I hope you enjoy the rest of the website and should you have any queries please do not hesitate to contact us by email or telephone. We are very proud to announce that for 2 consecutive years a St. John Fisher student company has been voted as winner of the Staffordshire Young Enterprise Company of the Year, as well as winning the prize for Best Innovation! 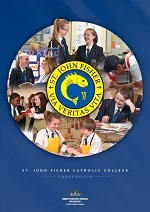 Parents who have a child in Year six and wish to apply for admission to St John Fisher Catholic College for Year seven need to contact their relevant local authority. The department consists of a team of the Special Educational Needs Coordinator (SENCo), a Higher Level Teaching Assistant (HLTA) and nine teaching assistants. We have recently updated our document regarding the Pupil Premium Grant 2017-2018, detailing what it is and how we will be using it to improve the quality of St John Fisher Catholic College. The last short Ofsted inspection of St John Fisher Catholic College took place before Christmas 2016, the school remains ‘Good’. We have several documents discussing E-Safety. All these documents are available to be downloaded from the e-safety page.